Corporate Wellness Insights: Bloomberg's New York Soda Ban - Soft Drink Scandal? Bloomberg's New York Soda Ban - Soft Drink Scandal? It’s not the newest of news anymore, but for those who haven’t heard, Mayor Bloomberg has proposed a controversial ban on the sale of soda and sugary beverages greater than 16 oz. The critics are calling this move overbearing, condescending, and draconian, but for most of us in the health world, now is the time to rejoice! It’s not as if 16 ounces of soda cannot be sold. Any New Yorker (or tourist!) is more than welcome to purchase multiple drinks. There’s also the option of getting a re-fill. Or, 16 ounces of liquid can be divided between two cups. This ban merely changes the status quo and nudges consumers towards healthier behaviors – like drinking less sugar. As the obesity epidemic surges full steam ahead, studies show that the environment plays a large role on the choices people make. A small soda at the average fast food chain is still a considerable amount of liquid. 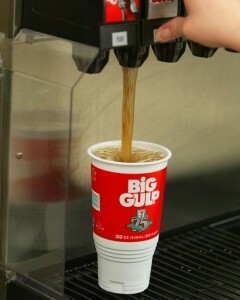 If Big Gulp sodas are removed from the environment, it helps smaller drinks become the norm once again. Those opposed to the change argue that adults should be entitled to make their own choices. They question whether the government should have the right dictate how much or how little sugar the people consume. That's a valid argument; however, consumers are already being manipulated. Advertising campaigns push us towards unhealthy choices to begin with, so a government intervention like this one is merely an attempt to lessen the marketing effect. We are not getting thinner as a nation. In fact, we are getting fatter and sicker and health care costs are skyrocketing. Possibly, these measures will fall flat. Much like calorie counts on menus did little to dissuade hungry customers, New Yorkers might opt to buy multiple sugar-sweetened beverages, or perhaps replace the big gulp with an extra dessert, but in general, this proposal should at least help normalize smaller, healthier-sized drinks. This regulation is just the first step towards a gradual process of change that must happen. Great step to be taken. Although at the moment it seems to be very much baby steps at least its in the right direction. Hopefully we can see this attitude spread and a few other cities taking up this approach.